America’s Gulf Coast; A Long Term Recovery Plan after the Deepwater Horizon Oil Spill, 130 pp. Sept.29, 2010. The report does not have a table of contents or an executive summary. The only summary I could find was the press release. The first 20 pages are the body of the report. A series of Recovery Planning Checklists are included in the report, which are interesting. This is more specific guidance than has been offered to state and local officials than provided to date by any federal officials, to my knowledge. 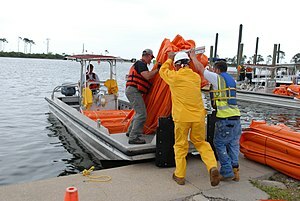 The BP Oil Spill disaster is important, since it is the only example we have of all phases of emergency management taking place under the authority of the Oil Pollution Act/National Contingency Plan rather than the Stafford Act /National Response Framework for major-to-catastrophic size disaster. This entry was posted in Deepwater Horizon Oil Spill, Government Reports and tagged Deepwater Horizon oil spill, environment, Gulf Coast of the United States, Petroleum in the Environment by recoverydiva. Bookmark the permalink.